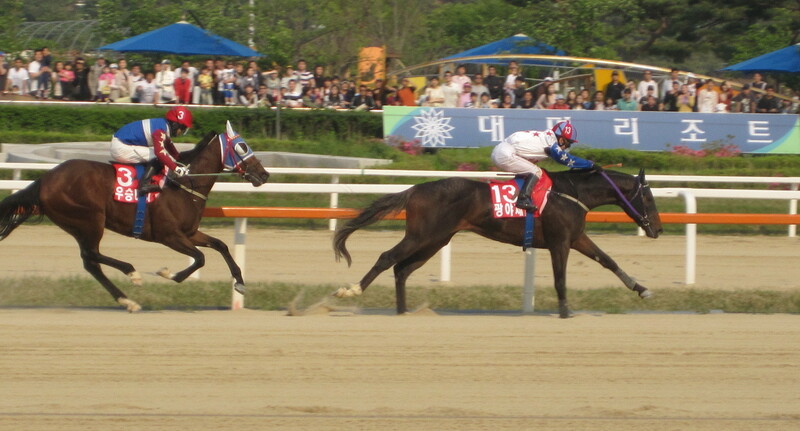 Dongseo Jeongbeol stunned the big guns to storm to claim victory in the Minister’s Cup, the final leg of the 2011 Korean Triple Crown, at Seoul Race Park this afternoon. 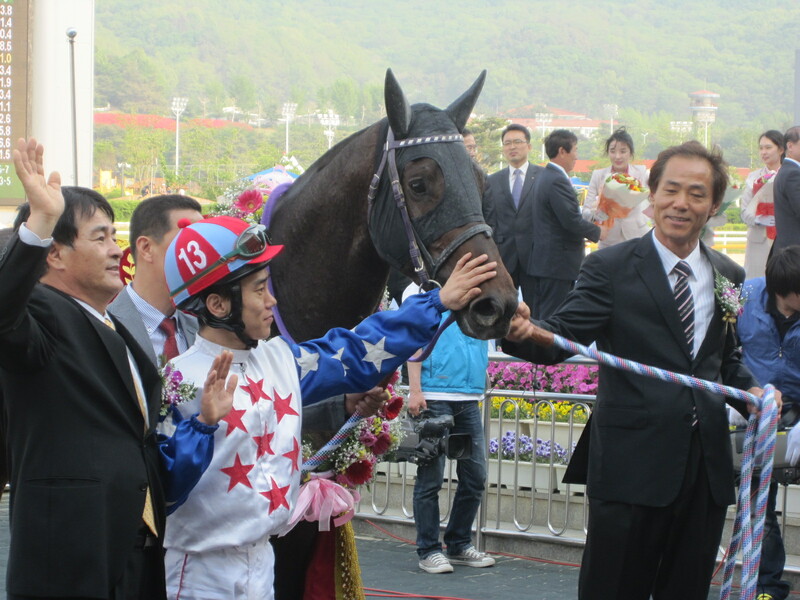 In a race which brought together the winners of all three previous races in the Triple Crown series – Soseuldaemun, Gwangyajeil and Useung Touch – Dongseo Jeongbeol was sent off as a 16/1 outsider, despite having won six of his ten prior starts. Things seemed to be going to form to begin with as Oaks winner Useung Touch (Menifee) set the early pace with Derby winner Gwangyajeil (Vicar) following closely behind. Midway through the back straight, the horse who was actually sent off the slight favourite, Champion Belt (Exploit) – the most expensive horse of this generation when sold as a two-year old, hit the front. All the while, Dongseo Jeongbeol (Vicar) and jockey Chae Gyu Jun were simply siting in the middle of the pack. As the field entered the home straight, battle commenced. However, Gwangyajeil was quickly out of it as Useung Touch seemed set to go on to claim the win. Then came Dongseo Jeongbeol on the outside. Third with a furlong to go, he was travelling much quicker than Useung Touch and he swept past the filly fifty metres from the line. Another fast finishing outsider Geuma Champ grabbed third. As for Gwangyajeil, he went backwards in the home straight eventually finishing thirteenth. 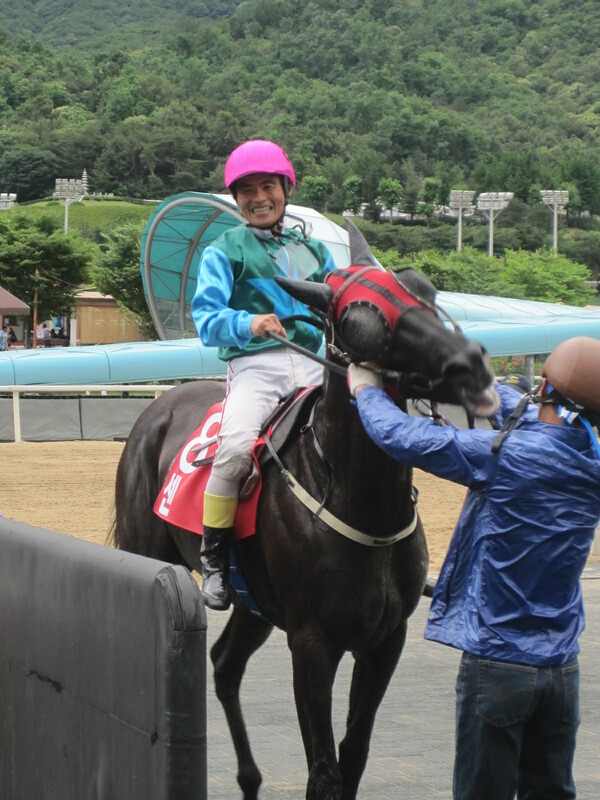 Indeed, the only horse he beat home was KRA Cup Mile winner Soseuldaemun – that first Classic victory looking more and more a flash in the pan although he did return lame. Gwangyajeil returned looking angry and didn’t want to trot for the vet. However, he didn’t seem injured. For Dongseo Jeongbeol it was, as mentioned earlier, he moves onto seven wins from eleven starts and a potential invite back to Seoul next month for the President’s Cup. His win means that horses from Busan claimed the Cup Mile, the Oaks and the Minister’s Cup with Gwangyajeil’s Derby win the only success for Seoul. 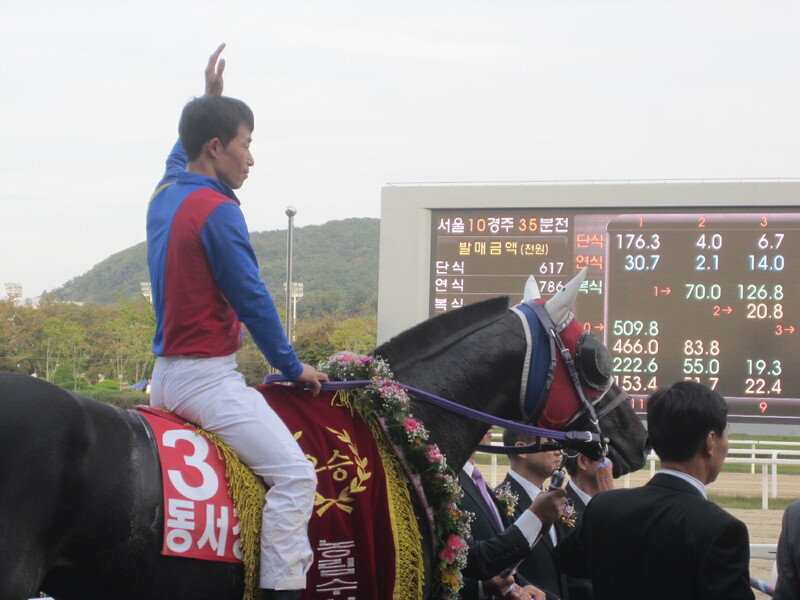 Dongseo Jeongbeol is the second classic winner this year by Vicar – in the sire’s first year of three-year olds hitting the track. Useung Touch continued Menifee’s strong performance in what is also his first season of classic runners. So, four classics and four different winners. A very competitive crop or just a poor one? We’ll know for sure when they start taking on the best older horses. That begins in the President’s Cup next month. * Next week big Stakes action returns to Seoul in the form n the KRA Cup Classic. 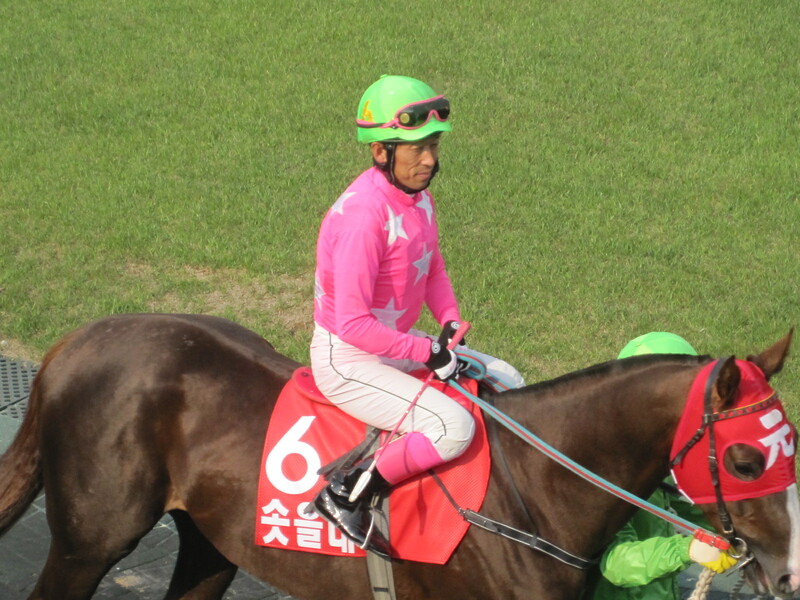 Tough Win, Dongbanui Gangja, Ace Galloper and even Baekgwang are all set to be there. Full preview coming soon! Eight fillies will travel down from Seoul to take on six of the Busan’s finest in the 2011 Korean Oaks at Busan Racecourse this Sunday. After three years of failure, Seoul regained the Derby this year and will be confident about finding a winner to make it a double in the Ladies’ Classic. Sen Girl won the Sports Seoul Oaks trial in June and is joined on the trip South by the three fillies who finished immediately behind her in that race: Mustang Queen, Allegrissimo and Seungniuihamseong. The fact that all four of the fillies have their regular jockeys travelling down with them, suggests that they are confident. Useung Touch heads the field on her home track. A surprise third place in the Breeders’ Cup at Seoul last November, she returned to the capital to score another shock when she ran second to Gwangyajeil in the Korean Derby in May. Areumdaun Party and Amass are also among the six strong contingent hoping to regain the Oaks for Busan which last year was won by 50/1 outsider Euro Fighter from Seoul. It’s an open race, with a case to be made for almost all of the full-field of fourteen who will line up at Busan at 4:15pm on Sunday. The Oaks is race 5 of a 6 race card which begins at 12:30pm. The big race will also be screened live at Seoul Race Park where there is also a full program of racing. Beat Sen Girl over 1700m in May and has gone close in useful company since. Chance of a place or even better if things go her way. Third behind Sen Girl and Mustang Queen in the Sports Seoul Oaks trial at Seoul, the extra 100 metres could be in her favour. With Moon Se Young on board, she can’t be ignored. Her wins have come at sprint distances-she’s never travelled further than a mile and didn’t impress at that distance. On form, she’s an outsider. Bang in form, winning her last three races at 1000m, 1200m and most recently 1700m, moving up in class each time. A wildcard who could cause problems. Another who has recently come into form, Amass is one of the few fillies in the race who has won at the 1800m distance. Has twice been beaten by Areumdaun Party in the past, those were at lesser distances. 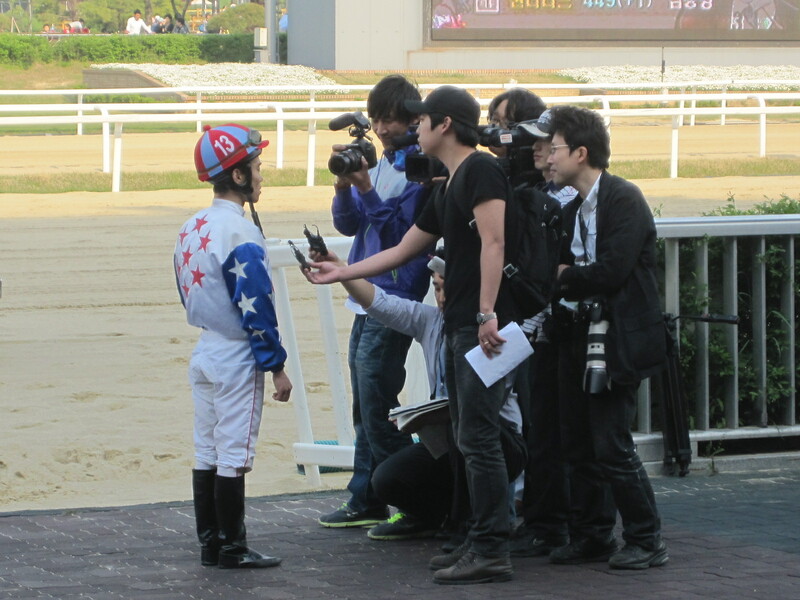 Jockey Jo Sung Gon is also not to be taken lightly in any Stakes race. 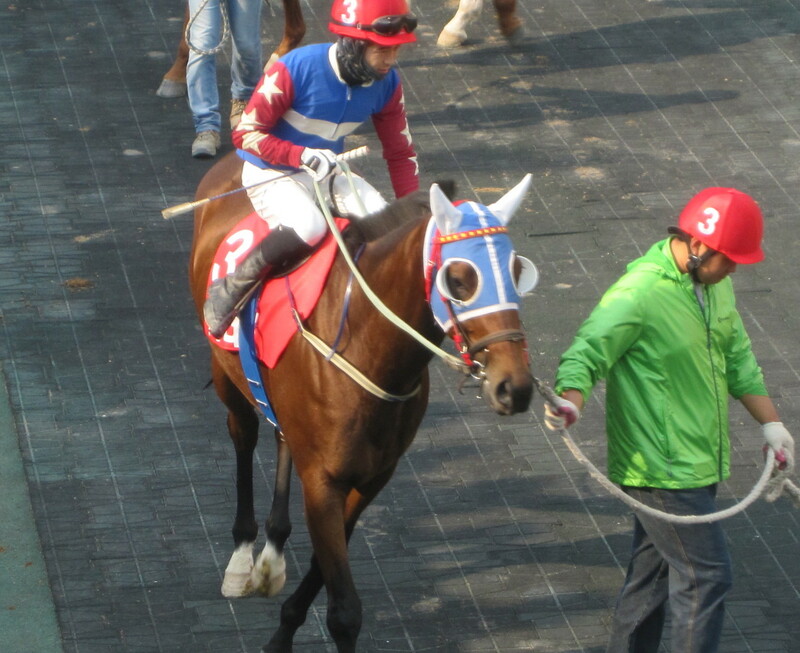 Won exceptionally smartly over the distance last time out, albeit at Seoul. A good place chance. 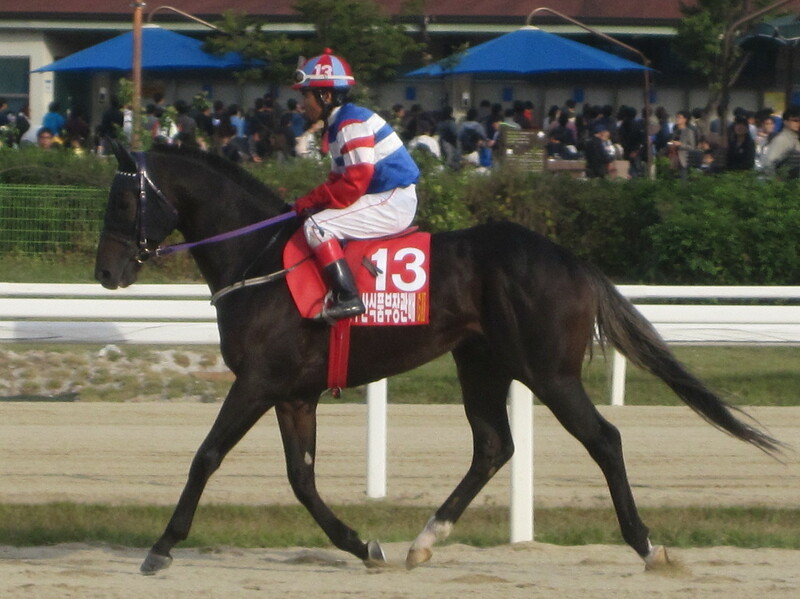 Beat Allegrissimo when wining over the distance in May but was fourth in the Sports Seoul. Will need to improve if she is to reverse that result. Narrowly beaten in the Sports Seoul, she tries her luck at 1800m for the first time and, with Seoul’s Jockey Championship leader Cho Kyoung Ho in the saddle, she’ll be one of the favourites. Coming into form at the right time with her two wins coming in her last three outings. Was a solid second in a tough race over the distance at Seoul last time out. May offer some place value. Untried at the distance she is therefore, despite her ten runs to date, still something of an unknown quantity. She ran second to Useung Touch last time out though and, unlike most fillies in the race, has already made it as far as class 2 and therefore deserves some respect. Akane is in form but it would be a surprise if she picked up her first Korean Stakes win here. Cyclone has never gone further than a mile and disappointed on both her attempts at that distance. Nevertheless, if you bet jockeys, Akane is the one to be on at the moment. Toshio Uchida has already won one Classic this year on Soseuldaemun in the KRA Cup Mile and Mr Pink could grab a second here. Areumdaun Party won smartly over a mile last time out and showed enough to suggest the extra furlong won’t be a problem. One of the favourites. Winning the Sports Seoul Oaks trial at Seoul automatically puts Sen Girl among the top picks here. Seemingly getting better with each run, she’ll be attempting 1800m for the first time and will have plenty of support in the betting. Was a shock 90/1 third place in last year’s Breeders’ Cup and then ran Gwangyajeil close in the Korean Derby, also at long-odds. This time she’ll get the respect in the betting that she deserves and one her home track, could be favourite to walk off with the biggest prize. It’s Derby Day and this race is anybody’s. 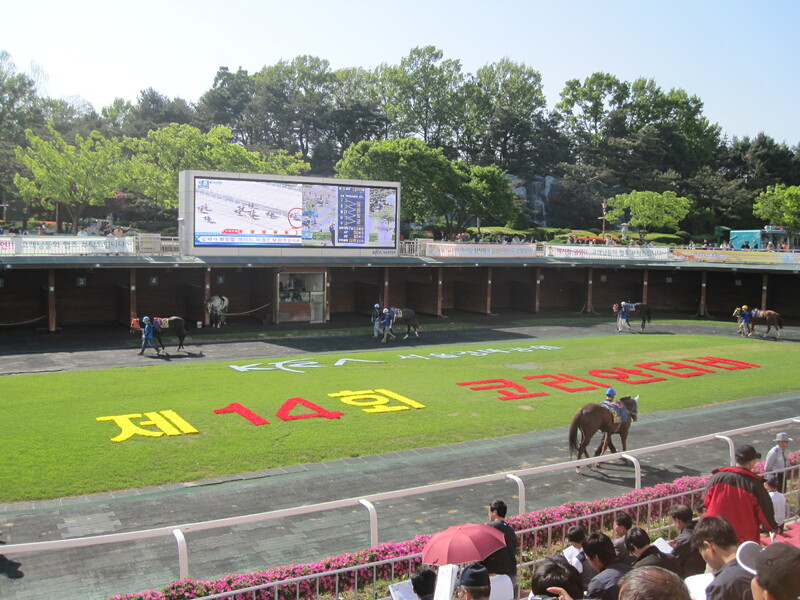 Soseuldaemun comes to Seoul on Sunday to attempt to win the second leg of the 2011 Triple Crown in the 14th Korean Derby. He’ll have thirteen out to stop him. Does a competitive field mean we have a weak crop of three-year olds this year? We’ll decide that at the end of the season, for now we can savour the prospect of a genuinely unpredictable race. It’s going to be a gorgeous day – albeit slightly breezy – and there’s sure to be a massive crowd in attendance. 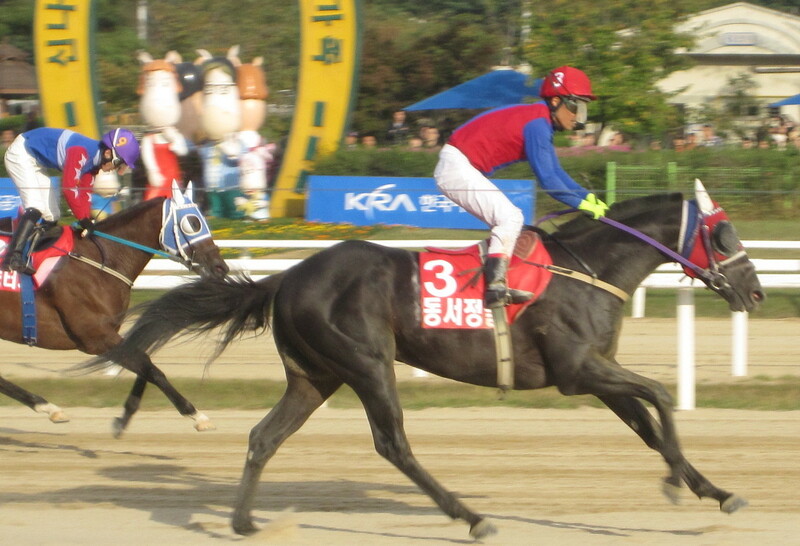 Half-brother of last year’s winner Cheonnyeon Daero, he was a late entrant and is improving all the time. Won’t be among the favourites but could spring a surprise after taking the lead early on. Won so easily last time out that there’es surely more to come. A strong chance. An unknown quantity at this distance, the filly will be at long-odds. She’ll start quickly and is the fastest horse in the race, but will she stay? Last year’s champion juvenile is proving tough to handle in races at three and a dreadful performance in the Cup Mile makes him hard to recommend for anything more than an outside chance at a place. Although untried at the distance, it shouldn’t be a problem but despite winning his last two, has shown nothing to suggest he’s capable of he massive improvement required to win here. The KRA Cup Mile winner and on-course for the Triple Crown. He will be well-fancied and with Uchida on board, cannot be discounted. Jockey Park has won the Derby twice before but it would be a major surprise if he added another here. An intriguing late entry, his dam also produced the very talented Blue Pin and Northern Ace, and his two recent wins suggests plenty more to come. Could be worth an each-way bet at decent odds. Too inconsistent to recommend here. Will be one of the outsiders. Half-brother to 2008 winner Ebony Storm and fourth in the Cup Mile, many believe there is plenty more to come from Cheonji Horyeong. Should be there or thereabouts. A month ago it was Geuma Who? But an impressive second behind Super Rich last month has put him right into contention. Has looked fantastic in trackwork and will have a lot of backers. All around the most complete looking horse. Second in the Cup Mile, he will most likely be the favourite. Some decent performances behind him but nothing to suggest he can beat some of the better known names. An outsider. So, who’s it going to be? This is a very open race so there is plenty of scope for betting. Gyongmaman will be losing a little bit of money on likely outsiders Champion Belt and Useung Touch. While he’ll be watching to see if any of Double Light, Soseuldaemun, Gwangyajeil or Geuma Champ offer any unexpected value, he will be sure to have a win bet on Singgeureounachim.